Celebrate the season in style at The Grand Kandyan! We are ready to delight you with gourmet goodness this holiday season! With the seasonal cheer just around the corner The hotel Grand Kandyan is abuzz with activities to ensure that an explosion of seasonal festivity is celebrated in style. Festive high tea with Christmas carol festival commenced the festive month at the Grand Kandyan. Many events are yet to follow the epic high tea. Seasonal goodies will be available at the Christmas goodies hut from 15th December onward, you can also listen to Christmas carols sung by the Grand Kandyan choir from 21st -24th December at the Lobby from 7.30 pm on wards. Seasonal beverages are available at newly opened pool side bar, “Sky Bay” with attractive deals for the festive season. Christmas Eve dinner will take place on the 24th December 2018 at the Golden Eagle ballroom with live music, carol performances, Santa arrivals and gift giveaways. 7 course epicurean set menu will be served at the Tamarind, our main restaurant for Christmas day lunch from 12 noon – 3.30pm. Traditional Christmas day dinner buffet with gourmet festive items will be served at the main restaurant on the 25th December from 7 pm – 10.30 pm. The hotels 31st Night celebrations come alive with the spectacular pre-dinner cocktail at the Lobby. 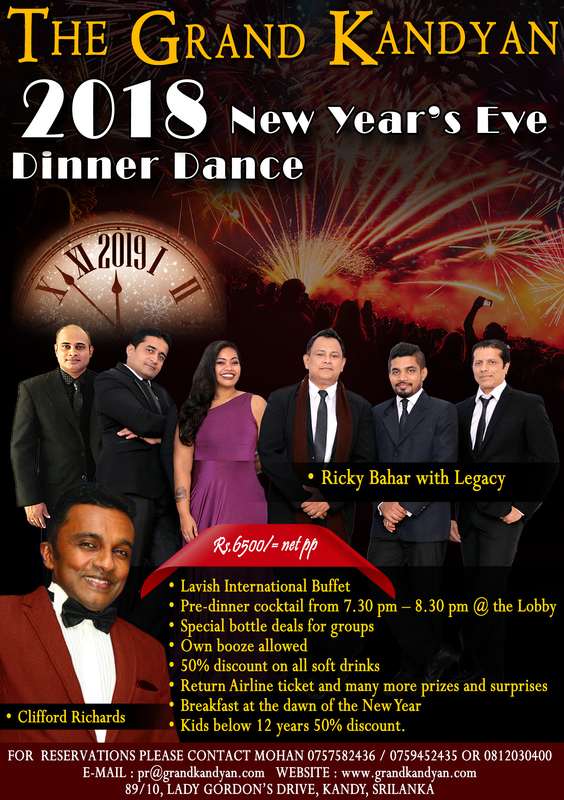 Unending entertainment from the eminent entertainer Clifford Richards and the famed dance band Ricky Bahar and Legacy. The night will be unimaginably entertaining with prizes and surprises. Let the seasonal cheer fill your heart as you step in to The Grand Kandyan to celebrate Christmas in all its glory and step in to the New Year with much excitement and joy. For all reservations please contact Mohan 0757582436 / Imesha 0759452435 or 0812030400.